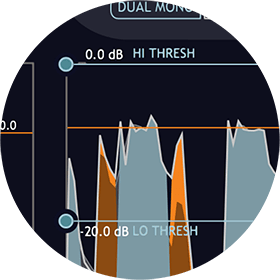 Unlike traditional envelope followers that detect incoming levels and utilize VCA to apply gain changes, DRUM LEVELER uses an advanced algorithm that takes full advantage of the digital domain and allows unparalleled transparent and phase-accurate control over your drums' dynamics. DRUM LEVELER's innovative dual HIGH / LOW THRESHOLD and TARGET LEVEL controls bring an unprecedented level of control that was not possible before. 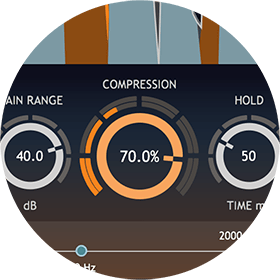 Just select the dynamic range of the drum hits you would like to work on and set the TARGET LEVEL to your desired value, and DRUM LEVELER will adjust the level of each beat accordingly. DRUM LEVELER will adjust each beat to bring its level closer to the TARGET LEVEL. Loud beats will be attenuated while softer beats will be amplified by the set COMPRESSSION amount. Setting COMPRESSION to a negative value will expand the dynamics of the performance and liven up any groove. 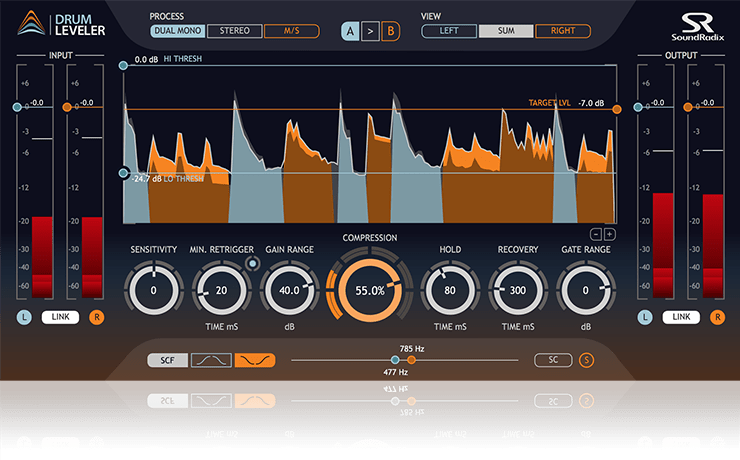 Adding the Side-Chain Filter to its unique dynamics action, DRUM LEVELER can be set to focus on individual drum elements and work its magic only on a selected spectral and dynamic range, leaving other elements of your drums unaltered. 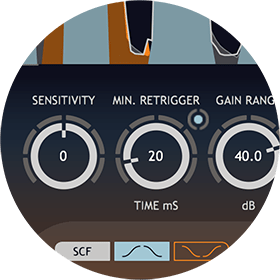 The GATE RANGE control can help reduce unwanted bleed or noise transparently without biting into your sound, keeping the original transients fully intact.